Brachial Artery is the direct continuation of the axillary artery within the arm which divides into radial and ulnar arteries. Please hover over the figure to get a brief info about the body parts. To get the elaborated info click on the body part. Please rotate the device for better visual interaction. It begins at the lower border of teres major muscle. It ends at the cubital fossa about 1 cm below the bend of the elbow joint, in the level of the neck of the radius. The artery at first is located on the medial side of the arm, then the artery gradually comes forwards in front of the elbow joint between the 2 epicondyles of the humerus. a. )In the upper party it is related to medial cutaneous nerve of the forearm, which lies in front of it. b. )In the middle part, it is crossed by the median nerve from lateral to medial side. c.)In the lower part,in the cubital fossa, it is crossed by the bicipital aponeurosis. 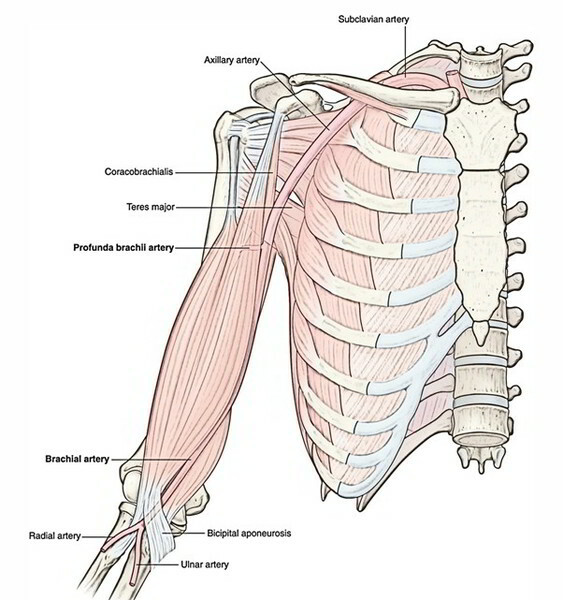 Posteriorly From above downwards, the brachial artery lies successively on long head of triceps, medial head of triceps, coracobrachialis, and brachialis muscles. Medially The ulnar nerve and basilic vein in the upper part of the arm; and median nerve in the lower part of the arm. Laterally The median nerve, coracobrachialis, and biceps in the upper part of arm and tendon of biceps in the lower part. The brachial artery is superficial throughout it’s course, being covered only by the skin and fasciae, thus easily accessible. Muscular branches to the muscles of the anterior compartment of the arm. Profunda brachii artery (largest and first branch). It originates from the posteromedial aspect of the brachial artery just below the lower border of the teres major. It accompanies the radial nerve with which it immediately leaves the lower triangular intermuscular space to goes into the spiral groove on the posterior surface of the humerus. Nutrient artery to humerus enters the nutrient foramen of humerus located near the insertion of coracobrachialis. Superior ulnar collateral artery originates near the middle of the arm and accompanies the ulnar nerve. Inferior ulnar collateral (or supratrochlear artery) originates near the lower end of humerus and divides into the anterior and posterior branches, which take part in the formation of arterial anastomosis around the elbow. Radial and ulnar arteries (terminal branches). Brachial pulse: The brachial pulse is commonly felt in the cubital fossa medial to the tendon of biceps and it’s pulsations are auscultated for recording the blood pressure. The biceps tendon is easily palpable on flexing the elbow. Compression of brachial artery: The brachial artery can be effectively compressed against the shaft of humerus in the level of insertion of coracobrachialis to stop the hemorrhages in the upper limb occurring from any artery distal to the brachial artery, example, bleeding wounds of the palmar arterial arches. Rupture of the brachial artery in supracondylar fracture of the humerus may result in Volkmann’s ischemic contracture.